Billy Stitchell and his small team on the shores of the Sound of Islay learned in July that Caol Ila 12 year old Single Malt Scotch Whisky had won the International Wine & Spirit Competition Trophy – the competition’s top award – for the best Single Malt Scotch Whisky under 15 Years Old. And last week, Billy went down in person to pick up the award, in a ceremony at London’s ancient Guildhall attended by wine and spirits makers from around the globe. Earlier in the year, Caol Ila 12 year old had set the scene for this supreme achievement by walking away with a Double Gold at the San Francisco World Spirits Competition as well as a Master at the Scotch Whisky Masters. From the other end of Islay, Lagavulin 16 year old and Lagavulin Distillers Edition, as so often before, won a Gold or higher award in every competition they entered. The IWSC judges spoke of “A stunning dram in its best condition”. 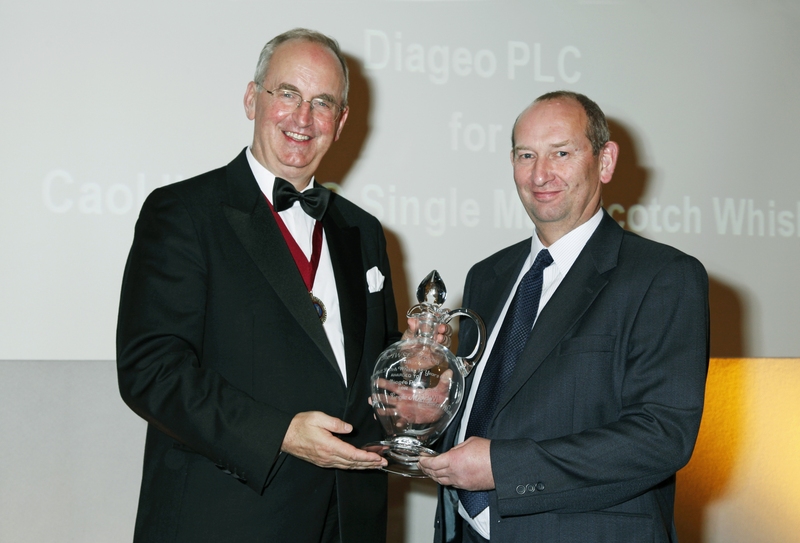 Photo shows Billy Stitchell, Distillery Manager at Caol Ila on Islay, receiving the IWSC Trophy for the best Single Malt Scotch Whisky under 15 Years Old from Prince Michael zu Salm-Salm, IWSC President, on 17 November 2010.